After overcoming a 0-2 hole against Playoff Rondo and the Chicago Bulls, and surviving a hard-fought 7-game series against John Wall and the Washington Wizards, Boston was ousted by LeBron James and the Cleveland Cavaliers in the Eastern Conference Finals, 4-1. 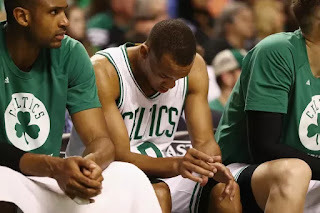 Their lone victory came in Game 3 on a game-winning three by guard Avery Bradley with 0.1 seconds left on the clock. The other games were lost by an outlandish average victory margin of 25.8 points. The C's got beaten like they stole something, but they shouldn't at all feel bad. Coach Brad Stevens and his troops have been playing with house money since 2013, when Boston's championship window was effectively slam shut with the trades of Doc Rivers to the LA Clippers and KG/Pierce to the Brooklyn Nets. The latter was not as much a trade as it was a heist, with Boston GM Danny Ainge fleecing Brooklyn GM Billy King out of first-round picks in '14 (No. 17, James Young), '16 (No. 3, Jaylen Brown) and '18, as well as the right to swap picks this year. You don't often see a 53-win team holding the No. 1 overall pick, but that's exactly where we're at. Thanks to Ainge's elaborate wheeling and dealing over the last few years, he has accumulated not just the team's go-to guy in Isaiah Thomas, but also several valuable pieces, picks and potential cap flexibility.